If you want to take the most beautiful photos with a private professional photography guide, viagra order this is the right tour for you! Our certified tour guides will support and accompany you on an adventurous eight day expedition to photograph the Mayan World. They will show you the perfect places to capture the most beautiful and amazing moments of nature and wildlife of Mexico on camera. Day 1: Arrival You will be welcomed by your professional photography guide. You will first get a briefing about the activities, our security and other important matters. You stay the night in Cancun. Day 2: Private reef After breakfast in your hotel, you go on a boat trip to your own private spot in the reef. Here, you can take gorgeous pictures of the wide diversity of colorful corals and fish such as the impressive barracudas, angelfish, sting rays or grunts. In the evening we take a hike through the Mayan Jungle to photograph wild spider monkeys, insects, reptiles and other interesting animals. Day 3: Enjoying Tulum After breakfast in your hotel, you go discover the archaeological site of Tulum with a breathtaking view on the Caribbean from a cliff and a large population of iguanas that will be posing on the archeological structures. Afterwards you go snorkling in the amazing Grand Cenote where you can take stunning underwater pictures of the stalactites and stalagmites. This cenote has crystal clear water and you experience the magical play of lights. You have an overnight in Sian Ka’an. *During the summer months: you can enjoy a special night hike at the beach in order to see and participate in the marine turtle project where it is even possible to adopt a turtle. Day 4: Bird watching in Sian Ka´an Begin the day with a bird watching hike to take pictures of exotic birds in Sian Ka’an. After breakfast in your hotel, you depart to Kantemo to discover a living mayan community and enjoy an amazing natural phenomenon. You can witness hanging snakes and bats as they come out of their cave. Afterwards, you are delighted in a thrilling night bicycle tour in the jungle. This evening will end with a spectacular boat trip where you can see crocodiles. During the day lunch and dinner is provided. Day 5: Bird watching, Valladolid & Rio Lagartos Reserve Begin the day with an early bird watching hike for more pictures of interesting birds. After breakfast in your hotel you depart to the colonial city of Valladolid to take pictures of amazing cenotes (Oxman). Follow to Rio Lagartos Reserve in order to enjoy observation of wildlife such as pink flamingos (largest population of America) and other exotic animals. Again lunch and dinner will proivided during the day and your overnight is in San Felipe. Day 6: Las Coloradas & Chichen Itza You have an early departure to Las Coloradas to take pictures of the salt pools with different shades of pink. 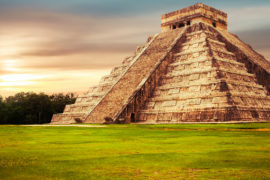 Afterwards, you go visit Chichen Itza to capture the best shots of the world famous main pyramid in the sunset. The overnight is in Cancun. Day 7: Whale Shark Tour or Sailfish adventure During summer months: you go on the Whale Shark Tour. After a breakfast in your hotel you enjoy a fantastic boat trip where you can photograph and snorkel with the biggest fish in the world, the amazing but harmless Whale Shark. You can also see manta devil rays and other marine animals. Plus you are going to eat and swim in one of the most beautiful beaches of the world: Playa Norte, Isla Mujeres (Conde Nast 2013). When you arrive back in Cancun, you can relax and enjoy the beach in the afternoon. During winter months: you go on a Sailfish Adventure. After breakfast in your hotel you can enjoy a fantastic boat trip where you can snorkel with the fastest fish in the world as they hunt their prey. You can get spectacular underwater pictures of this natural interaction. After this impressing tour, you go back to Cancun to relax and enjoy the beach in the afternoon. Day 8: Transfer to Airport This is the last day of your great adventure. You have a breakfast in your hotel and afterwards private transfer to the airport in Cancun.